Posted May 3, 2011 . About six weeks ago, I started to have a “sensation” in my lower right molar. It was not a pain, it was a odd feeling. I am a trained professional. I don’t just play one on TV. (Though I have recorded a few videos and have posted them on Youtube and for my facebook page. But, I digress!) I knew this was not “normal”. I kept track of this and all other symptoms. With time that transient “sensation” turned into pain with cold and hot and pain when biting anything harder that bread. This all happened at a time when I had so much going on. I called a dentist friend and set a time three weeks into the future. He offered time that week, but I just could not do it. I was traveling to Columbus, OH and Provo UT. It needed to wait for this past Friday. Dr. Brad Laird is not just any dentist, he is an endodontist. (He wears an “E” on his chest!) He specializes in root canals. His practice is in Joplin, MO. (I would attach a link, but he does not have a big online presence, yet–I will work on him about that!) I know what you are thinking… dentist love to inflict pain, so an endodontist must specialize in inflicting pain! I humbly submit you are wrong on both counts!! Dr Laird told me that he was going to treat me like a regular patient. He wanted me to experience everything a non-dentist would experience. He explained every step to me. He treated me quite gently. He was thorough and well-versed in the use of high tech equipment. I am a difficult patient to numb and he had to go through an extended list of numbing techniques, but he got me numb! With the use of his microscope he was able to determine that my existing crown was leaking and that the bacteria was infecting my nerve tissue. He removed my decay and my infected nerve, and filled my tooth. I was done in about an hour and a half from when I arrived at his office. Wow! A root canal without any pain! That may seem strange to you, based on the horror stories that everyone shares. With today’s improvements in medicines and techniques there is no reason to panic. Pain control is important to dentists. In dentistry, you can’t always see the results: but you can feel them. You need to feel comfortable. This past week’s experience was good for me. It helps for me to “get it the chair” from time to time. I now have a renewed empathy for my family of patients. I can learn first hand who the best specialists are, so I can refer to them with confidence. If you have any dental questions or want to schedule an appointment, please contact us at (620) 231-6070. You can also find us at our website, www.pittsburgkansasdentist.com. We want to be your family dentist and we want you to feel comfortable! 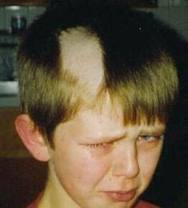 Oh yes, you go to the barber with the bad hairdo, he got his haircut by the least talented barber!! (Think about it.) Everyone go out and have a great week.